Brain Age: Concentration Training (titled Dr Kawashima's Devilish Brain Training: Can you stay focused? in Europe) is the third full installment in the Brain Age series, developed for Nintendo 3DS and released in Japan in 2012 and North America in 2013. In Europe, the game was originally planned to be released on March 8, 2013. However, it was later announced that the release was pushed back to April 12, 2013, and on April 9 the release was pushed back indefinitely. However, during the April 2017 Nintendo Direct, it was announced that the game would be released on July 28, 2017. Try to improve your focus and concentration! All-new brain-training exercises have been designed by world-famous brain researcher Dr. Ryuta Kawashima to combat distraction and refocus the modern mind. The difficulty of each Devilish Training exercise adjusts to match your ability. Play fun activities designed to give your brain a break. Brain Age is back with all-new devilishly tricky brain-training exercises designed to help retrain the modern mind. With all of the technological distractions of modern life, information overload and information addiction can make it difficult to stay focused. Brain Age: Concentration Training uses newly designed exercises that will test your short term memory access and help to improve your concentration skills to combat these daily distractions. New Devilish Training exercises dynamically adjust their difficulty based on your real-time results, always pushing to improve your ability, alongside additional new and classic puzzles. 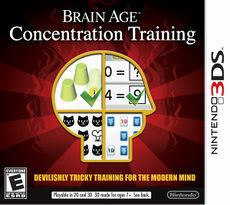 Discover the next level of brain-training – only for Nintendo 3DS. People today have numerous devices to stay connected (e.g. laptops, smart phones, tablets), and these distractions have led to an information overload making it difficult to stay focused on specific tasks. Brain Age™: Concentration Training brings newly designed training exercises that will challenge players with activities to help improve their concentration skills and the ability to access their short term memory. Spend at least 5 minutes a day to try and better your focus and attention skills. The new Devilish Training exercises dynamically increase or decrease in difficulty based on your real-time results to help consistently train players at the limit of their abilities. ↑ 1.0 1.1 Nintendo Direct - 12.04.2017. Nintendo UK (YouTube; April 12, 2017). Retrieved April 12, 2017. ↑ Dr Kawashima's Devilish Brain Training: Can you stay focused? arrives on Nintendo 3DS. Nintendo Australia. Retrieved August 4, 2017. ↑ Dr Kawashima's Devilish Brain Training: Can you stay focused? on Nintendo of Europe's website. Retrieved September 26, 2016. This page was last edited on 5 August 2017, at 00:41.